In September 2009, I made a visit to the Modern Art Museum of Fort Worth, Texas. There I looked to the Ferrari” entitled picture, which for me was (in contradistinction to “Alfa Romeo” and “zwei (two) Fiat”) unknown. My attempt of an explanation by the museum staff only led to the conclusion, I was not the first, questioning. More than a year later, I got the reference to the Archive Richter in Dresden. Thereafter, everything went very fast. A small series of photos, which were taken in 1964 (“Ferrari” and “Two Fiats”) and 1965 (“Alfa Romeo”), emerged in addition to the early photo-realistic works of German painter Gerhard Richter, leading artist in the Kunstkompass 2010 (ranking of the 100 most important living artists). While at least one of the “Two Fiats” could actually be a vehicle made by this particular manufacturer (Series 1300/1500), based on the roof shape and rear of the car, merely a slight uncertainly exists with “Alfa Romeo” (Giulia TZ 1) concerning the correct model – however not the manufacturer’s designation. The most conclusive is the identification of the vehicle depicted in “Ferrari”. Only that it clearly is not a Ferrari. 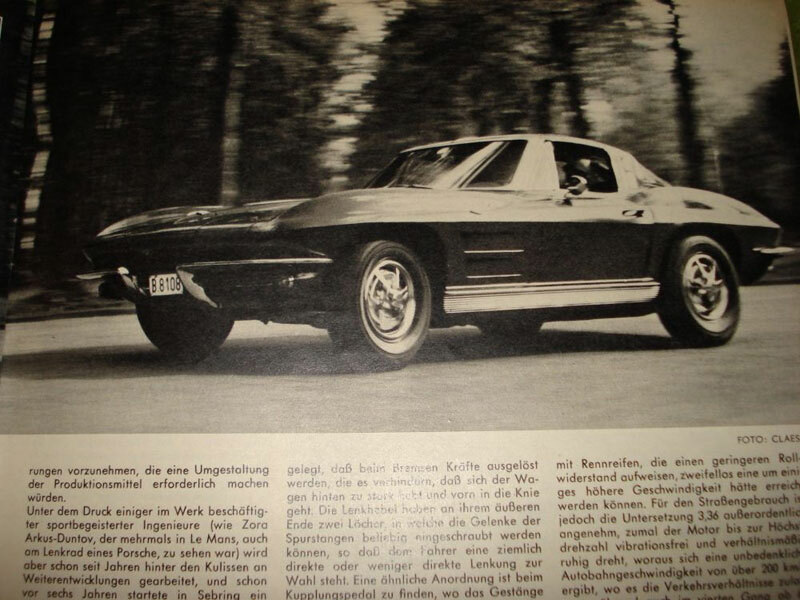 The test report on a Corvette “Split Window” by Auto Motor und Sport magazine (issue 15/1963) actually formed the basis of the artistic adaptation. This inevitably raises the question regarding background and sense of the disassociation by name. Particularly since the incorrect manufacturer’s designation is very easily recognizable in this case, as mentioned earlier. Furthermore, it is not just “any” car, but a great American icon – as American as Coca Cola and Rock ‘n’ Roll. More importantly, it is the originator of an entire generation of the “Sting Ray” version of a motor vehicle ennobled across the great pond as “the true American sports car”. On the other hand, it is difficult for a Ferrari owner or fan to understand why a vehicle, which wasn’t even produced in Europe (let alone Italy), would usurp the Ferrari name. Sacrilegious, like calling a pizza Margarita a hot dog. Perish the thought. For one thing, it has not (yet) been fully clarified if the naming was based on a deliberate provocation, or if it was merely wishful thinking. 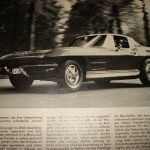 On the other hand, it is easy to forget that the Corvette idea was just ten years old at the time – far away from today’s legendary status, it being virtually “unknown“ in Europe. The Ferrari has long been an epitome of the sports car par excellence, synonymous with the unfulfilled dreams of men. Finally yet importantly, one cannot deny that the Corvette pictured does bear a slight resemblance to the Ferrari 250 GT “Berlinetta” produced during that time or the discontinued 250 GT “California”. The story certainly would have been different if it had been established, shortly after creation, that this piece would be bought by a Texas museum, or was planned from the outset as a commissioned project for a U.S. American buyer. An elucidation through a corresponding publication would have then been the result. Therefore, this piece did not become the property of the “Modern Art Museum of Fort Worth” until 1997. The title of the picture “Ferrari” has now been recorded in the catalog of works and will not be changed. Perhaps it is reassuring for those, who have searched the Internet for relevant literature or, as I in situ, have attempted to find an explanation for this not necessarily logically contradictory, but factually wrong and manifestly absurd designation; and also not after having found an answer to date even through intensive “googling”. The long overdue thematization of this anomaly may bear the answer to all unanswered questions – by the only person who comes into question here – the artist Gerhard Richter himself. The opportunity to visit the Gerhard Richter Archiv, an institution of the Staatliche Kunstsammlung Dresden, presented itself more than two years after my stay in Fort Worth. The original edition of the Corvette test report is now part of the collection, as the artist frequently made use of magazines or journals as a template for artistic adaptations during his career (these are archived as an attestation to this fact). I was also afforded the chance to examine the original “two Fiat” documentation, which in fact was a part of a “Sarotti” chocolate advertisement. The allocated naming is definitely of an abstract nature (in this case as well) given the fact that the original document pertaining to these two vehicles is just as “blurred” as the actual painting itself (also referred to as “The Master of the Blur”). Only with great effort was I able to identify one of the vehicles as a Ford 12 m, without actually being one hundred percent sure in the process. As a result, Gerhard Richter certainly did not waste any time whatsoever searching for the corresponding vehicle manufacturer. This would explain the putative “negligence” in naming the painting “Ferrari”. After all, only the dynamics of the original document had fascinated the artist: And since this obviously was a fast car, the term “Ferrari”, as a synonym, presented itself far better than “Corvette”. Nevertheless, I am more than happy with these results. Firstly because Richter was not consciously aware of the “improper title” up until now. Secondly, in light of this discovery, he stated that he did not intend to change or supplement the name with the word “Corvette”, as the painting is very well known in the art scene under its original name (which is his prerogative, of course). My questions of 2010 were therefore answered in full. In conclusion, the Richter confidant and head of the Gerhard Richter Archive, Dr. Elger, ycleped my research results as exemplary for the exciting activities undertaken while researching the background and work genesis of this exceptional artist.